My edition: paperback (proof), part 1 published on 14 July 2014 by Sphere, 280 pages (full book). Description: Elle and Laurie are the last ones standing: they're single, they're not having babies any time soon and their weekends aren't filled with joyful meetings about mortgages. For Elle, this is fine - she likes her independent life, she loves her job, and she has no desire to walk down the aisle anytime soon. But Laurie wants love and she wants it now. Lisa Dickenson won the Novelicious Debut of the Year award for her first novel, The Twelve Dates of Christmas. While I haven't had a chance to read it yet (which will be rectified soon! ), after reading the snort-out-loud funny You Had Me At Merlot I completely understand why her witty writing was favoured over many other fantastic debut novels. Elle is one of the few people in her social circle who is still single. She is totally okay with that though, as her life revolves around her work and she loves that she can do as she pleases without having to consult an other half on everything. But when her bestie, Laurie, breaks up with her boyfriend she is not as contempt with singledom as Elle is. Laurie is determined to get married as soon as legally possible and in her desperation to find a man to help her obtain this goal she's willing to do just about anything. When Laurie suggests a singles holiday, this sounds like Elle's worst nightmare. Being forced to spend what should be a relaxing break from work with a bunch of strangers whose sole focus on the trip is finding their perfect partners? Yikes. But plied by a getaway to the stunning Italian countryside and the promise of lots of wine, Elle reluctantly agrees to come along. She intends to visit only for the picturesque views and alcoholic beverages on offer, but with romance lingering in the Tuscany air will she too find a handsome beau to spend the hot Italian nights with? There are not enough adjectives to express how fantastic this novel is! The writing is incredibly funny, witty and refreshing, and I would liken it to that of the equally fantastic Lindsey Kelk though that wouldn't be fair to either of the two ladies. While they both manage to make me snort out loud on the train up until the point that people start staring at me, not to mention make me swoon quite literally over the gorgeous men within their pages, they each have their own unique voice when describing their heroine's hilarious escapades. And hilarious they are. The novel is being released in four digital parts throughout July and August. While I'm normally not a fan of short stories or books that have been split up into smaller segments, because so often the lack of page numbers results in a lack of plot and character developments, this superb romantic comedy singlehandedly shows that it can be done well. Each part had its own engrossing storyline with plenty of surprises along the way and ending on a nail-biting cliffhanger that will have you counting down the days until you can get your eager hands on the next part in the series. 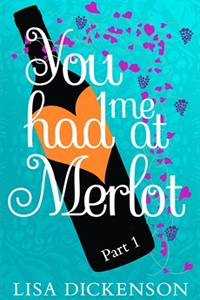 You Had Me At Merlot is one of the most hilarious novels I've read in yonks and I absolutely loved it to pieces. Lisa Dickenson's writing is fresh and a lot of fun, and I'm super excited to have found a new voice in women's fiction whose books I will be looking out for from now on! You can pre-order all four parts of the novel from Amazon.co.uk and Amazon.com.